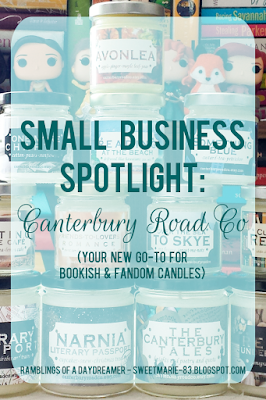 July is the one-year anniversary of my favourite bookish candle shop, Canterbury Road Co. I don't remember exactly when I discovered Shan's shop, but it wasn't long after she opened. 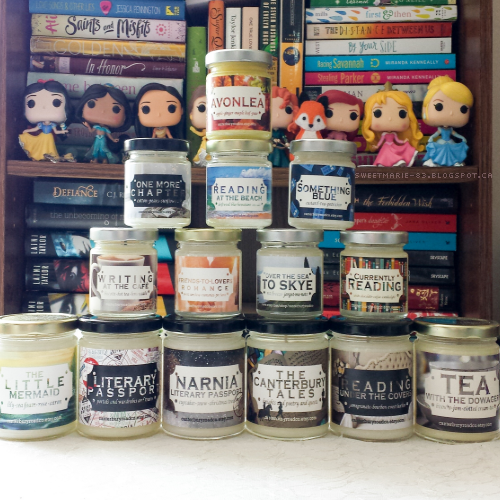 I was envious of my fellow bookstagrammers who had a plethora of bookish and fandom candles as props in their pictures. 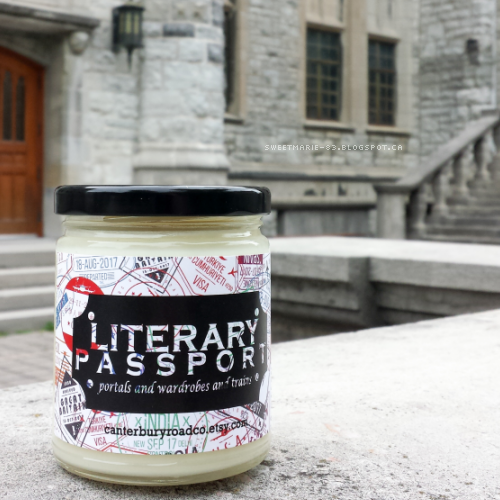 I had checked out a few different shops and figured I would remain candle-less because of the cost of shipping to Canada. I knew it wasn't the shop owners' fault - they don't control the price of postage, but it was disheartening. Finally, I decided I just had to have some of Canterbury Road Co's gorgeous creations, and the rest, as they say, is history. Since then, despite the price of shipping, I've placed several more orders with CRC because her candles are just that awesome. I watched Shan's Instagram feed like a hawk for a rep search, and when she finally announced one, I crossed my fingers and applied. The day she messaged me to ask if I'd be a rep for her for the month of July was pretty much my best bookstagram day ever! My rep package for the month of July included four of Shan's July releases: Narnia (the newest in her Literary Passport line), Reading Under the Covers, Friends-to-Lovers Romance (the newest in her Romance line), Reading at the Beach, plus her anniversary candle, The Canterbury Tales, and one of my wishlist candles, One More Chapter. I love every single one of them. Shan's candles are beautiful and they smell incredible. She makes the most unique scent blends that just blow my mind. Shan has staples that always stay up in her shop, and she adds new monthly candles, most of which are only available for that month. She also occasionally has sales (like her recent anniversary sale) where she brings back popular/most requested retired or older scents. She also does BOGO sales on her wax melts, which always seem to be popular! The best place to learn about her sales and promos is from her Instagram. I only have a couple of days left in my rep term, but I'll continue to support Shan in every way I can because she's an incredible person and a ridiculously talented candle witch. Until the end of July, you can use my rep code SWEETMARIE17 to save 17% on any order, and after that you can visit Shan's Instagram feed to find her other reps for their codes. Being a rep for Shan for the month of July has been such an honour. She's so talented and generous, and it's been a joy to show off her candles as often as I can. Pictured above are all the candles I currently own. I'll be adding to this massive stack soon because I bought five more during her anniversary sale! If you'd like to see more of my pictures featuring Shan's candles (there are a lot; I love them so much I can't help but include them in the majority of my pictures), check out my bookstagram feed sweetmarie_83. You can see other people's pics of Shan's candles by checking her tagged photos or the hashtag #canterburyroadco. Please note, Shan is moving her shop from Etsy to a standalone site in August (you can be notified by email when the site is ready). I'll update this post when that happens, but for now, you can check out her Etsy shop for her beautiful creations! 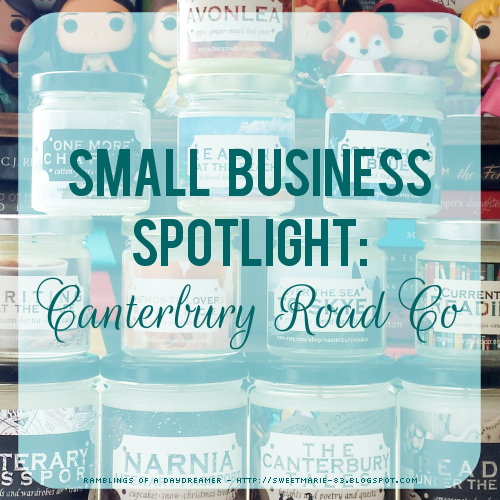 Do you have any of Canterbury Road Co's candles? Any you'd like to have? 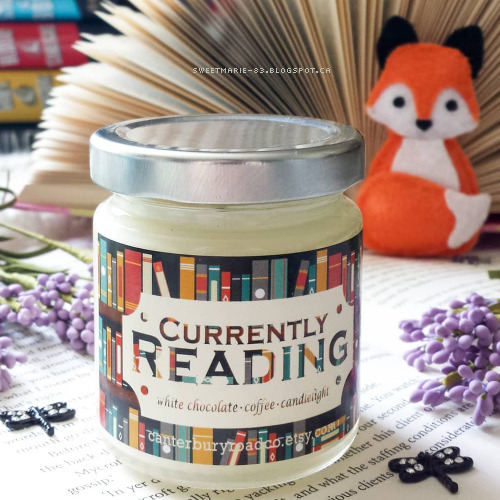 Do you have a favourite bookish candle shop? If you enjoyed this post and would either like to refer to it again or help spread the word about this amazing small business, please share on Pinterest, Facebook, and/or Twitter! I used the heck out of your rep code, and I'm super happy with my two candles. 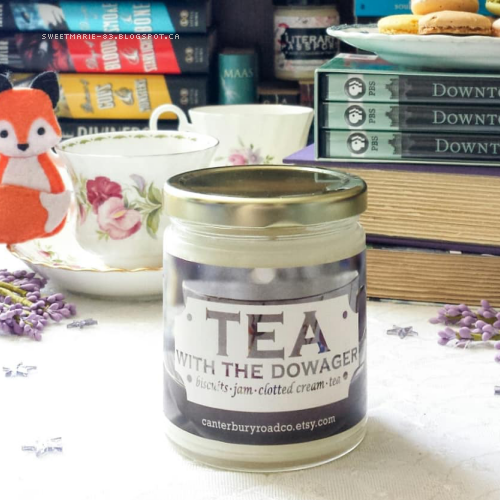 Tea with the Dowager, and Hobbit Hole :) I'll second everything you say in your post!